Read our trick-or-treat safety tips and remember to turn your porch light on during trick-or-treat hours to show you're handing out treats. Please consider participating in the Teal Pumpkin Project by offering offering non-food treats, such as glow sticks or small toys, as an alternative to candy, for those with food allergies. Don't see your city, town or village listed below? Keep checking back as we continuously update the list through Halloween or contact your local city/town/village clerk for information. The Town of Algoma does not set a specific date or time for trick-or treating, but adheres to the City of Oshkosh's date and times. The Town of Anderson does not set a specific date or time for trick-or-treating. Trick-or-treat is always held on Halloween from 4-8 p.m. The Town of Arena does not set a specific date or time for trick-or-treating. Trick-or-treating is held in the Village of Campbellsport. The Village of Baldwin does not set a specific date or time for trick-or-treating, however Halloween night from dusk until 8 p.m. is the recommended date & time. Leave your front porch light on to participate. The Town of Barnes does not set a specific date or time for trick-or-treating. The Town of Black Earth does not set a specific date or time for trick-or-treating. The Town of Blooming Grove does not set a specific date or time for trick-or-treating. The Town of Bradley does not set a specific date or time for trick-or treating, but adheres to the City of Tomahawk's date and times. The Town of Brighton does not set a specific date or time for trick-or-treating. The Town of Brillion does not set a specific date or time for trick-or treating, but adheres to the City of Brillion's date and times. The Town of Bristol does not set a specific date or time for trick-or-treating, but adheres to the City of Sun Prairie's date and times. Trick-or-treat is always held on Halloween from 5-7:30 p.m. The Town of Brule does not set a specific date or time for trick-or-treating. The Town of Buffalo does not set a specific date or time for trick-or-treating, but adheres to the City of Montello, Pardeeville, and Dalton dates and times. The Town of Burke does not set a specific date or time for trick-or-treating. Trick-or-treat is always held on Halloween from 5:30 to 7:30 p.m. The Chilton Lions Club will not have a movie at the Chilton theater. The Village of Dane does not set a specific date or time for trick-or-treating. The City of Eagle River does not set a specific time for trick-or-treating. Grab your little ghosts and goblins and join us for trick-or-treating through the shops of Egg Harbor. Look for a sign in the windows at participating shops. The Town of Erin does not set a specific date or time for trick-or treating, but adheres to the City of Hartford's date and times. Children (and adults) in costume may trick-or-treat for free at participating downtown businesses and farmers market vendors on Main Street between Merrill Avenue and Fourth Street. Children must be accompanied by an adult. The Town of Fredonia does not set a specific date or time for trick-or-treating. Trick-or-treat is always held on Halloween from 4-7 p.m. Enjoy a day of family-friendly fall activities.Trick-or-treat at participating businesses from 11 a.m. - 3 p.m. (costumes optional). Participating businesses will have a trick-or-treat sign on their door. Be sure to collect your participation sheet at any of the stops or the red sculpture park and get them stamped at each trick-or-treat location. Turn in that completed participation sheet at any of the stops to be eligible to win a $25 gift card. Don’t forget your candy bags! The Town of Hartford does not set a specific date or time for trick-or-treating. Trick-or-treat is always held on Halloween from 6-8 p.m.
Trick-or-treat is always held on Halloween from 5-7 p.m.
Trick-or-Treat is from 5:30pm to 7:30pm on the Sunday before the 31st, unless Halloween falls on Saturday or Sunday. Start trick-or-treating at the Farmers Market, where you can pick up a map of participating businesses around the downtown. Hop on and off the free trolley to visit all the stops during this free family-friendly event. The Town of Kewaskum does not set a specific date or time for trick-or treating, but adheres to the Village of Kewaskum's date and times. The Town of Liberty does not set a specific date or time for trick-or-treating, but adheres to the Sister Bay's Fire Station fun. Trick-or-treat is always held on the last Saturday in October from 5-8 p.m. The City of Lodi does not set a specific date or time for trick-or-treating, however Halloween night from 5-8 p.m. is the recommended date & time. The Town of Lowell does not set a specific date or time for trick-or-treating. The City of Madison does not set a specific date or time for trick-or-treating, however Halloween night from 4-8 p.m. is the recommended date & time. 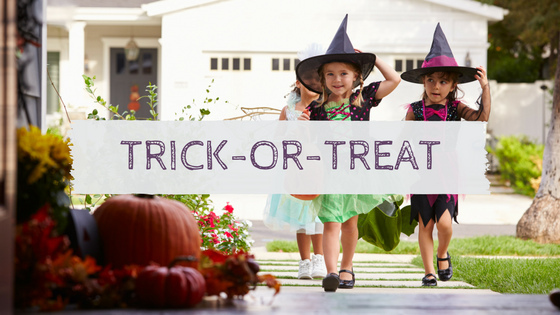 Kids in costume are invited to visit participating Monroe Street businesses for treats! Trick-or-treat is always held on Halloween. There are no set hours. Trick-or-treat is always held on Halloween from 5:30-7:30pm. Trick-or-treat is always held on Halloween from 5:30-7:30 p.m.
Trick-or-treating is held in the Village of Mishicot. The City of Monona doesn't have official trick-or-treating hours. The tradition in Monona is that kids trick-or-treat on Halloween evening. Suggested trick-or-treat hours are 5:00-8:00 PM. The Village of Nashotah does not set a specific date or time for trick-or treating, but adheres to the City of Delafield's date and times. The Town of New Denmark does not set a specific date or time for trick-or treating, but adheres to the Village of Denmark's date and times. The Town of New Holstein does not set a specific date or time for trick-or-treating. Please donate clean, gently used or new winter apparel. Items can be dropped off at the Historical Society on Sunday until 6 p.m. The Town of River Falls does not set a specific date or time for trick-or-treating. Late afternoon - 8:00 p.m. The Village of Shorewood Hills does not set a specific date or time for trick-or-treating, however Halloween from late afternoon to 8pm is the general date & time. Trick-or-treat is always held on Halloween from 5-8 p.m. The Town of Stockbridge does not set a specific date or time for trick-or-treating. The Town of Summit does not set a specific date or time for trick-or-treating. The Town of Turtle does not set a specific date or time for trick-or-treating, but adheres to the City of Beloit's date and times. The Town of Verona does not set a specific date or time for trick-or-treating, but adheres to the City of Verona's date and times. The City of Washburn does not set a specific date or time for trick-or-treating, however Halloween night from 5-8 p.m. is the recommended date & time. Greenfield Ave from 70th – 76th St. The West Allis Downtown Business Improvement District (BID) welcomes visitors to come in costume for Halloween treats from participating West Allis Downtown merchants. The Town of West Point does not set a specific date or time for trick-or-treating. The Town of Westport does not set a specific date or time for trick-or-treating, but adheres to the Village of Waunakee's date and times. Bring your little ghouls in their costumes to uptown businesses for a howling good time playing games and treats! The Town of Woodville does not set a specific date or time for trick-or-treating. The Town of York does not set a specific date or time for trick-or-treating. Using these dates on your website? Please link to us! HauntedWisconsin.com - Your Source for Halloween Events & Haunted Houses in Wisconsin! Or use one of our banners.